Breezes are bad. So are the nearby sirens from the fire department. And rain? Forget it. Those are some of the challenges of the Tidewater Community College Theatre’s “Shakespeare in the Grove” – now in its 17th year. But the show must go on, as TCC Theatre brings Hamlet to the stage, with performances June 27-30 and July 1 at the Chesapeake Campus’ outdoor theater on the corner of Cedar and Bells Mill roads. All performances are free and at 8 p.m.
“One of the biggest challenges is always the weather,” said Ed Jacob, director of TCC Theatre and associate professor of theatre and speech – and as if right on cue, it starts to sprinkle. The show doesn’t go on if lightning is present, but sirens from the fire department on Cedar Road call for a more creative solution. “We dim the lights and the actors freeze,” Jacob says. Once the noise pollution passes, the play continues. Twenty actors that include current and former students comprise the cast and crew that have six weeks to deliver a two-hour production, which has become a well-attended community event. Parks ultimately succeeded by finding a mix of sounds clips from YouTube, including instrumentals from AbnyPark, a Seattle band that relies on industrial and world music, and Vernian Process, an avant-garde band favoring Victorian scientific romance. The costumes are elaborate and can get warm on a humid 90-degree night, which is often the case in the Grove. Decked out in a brown velvet blazer, laced up to her chin, an underskirt under her plaid skirt, tights and boots, Alicia Smith is Ophelia, a part she relishes because of the madness in the character. Shakespeare in the Grove veteran John Cauthen enjoys his dual role. “I play both brothers. 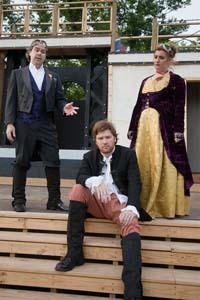 I play Claudius the villain, and I play the ghost of Hamlet’s father.” The quick change can be tricky. At one point, Cauthen has to put the crown and king’s clothes back on and take the ghost sheet and beard off in what amounts to half a page of lines. When the show goes live, the real fun begins. For information about Shakespeare in the Grove, please call (757) 822-5219.